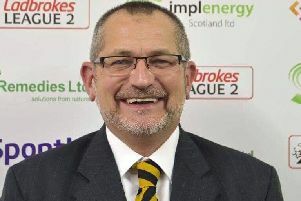 Berwick manager Johnny Harvey was disappointed not to have been able to end a ‘difficult week’ for the club with a win on Saturday. 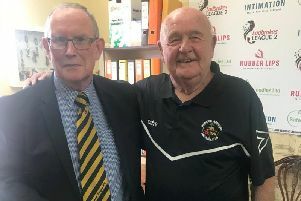 Following on from the death of club legend Ian ‘Pea’ Oliver, who had over 50 years service as a player, coach, physio, groundsman, caretaker manager and kit man, Harvey had been hoping his side could end their eight match winless run and get their season back on track. But a first half penalty from Dylan Macklin and a second half header from Darren Smith put Stirling in the driving seat. Lewis Barr netted with a tremendous late strike from 25 yards to give Rangers some hope, but they were unable to complete a fight back. “It’s been a difficult week for the club and our thoughts are with ‘Pea’s’ family at this time, it’s just a shame we couldn’t get a result for him,” Harvey said post-match. Berwick have now picked up two points from 27 and remain second bottom. Twice in the first half hour Albion had the ball in the Berwick net, but twice they were denied by a flag for offside. Berwick’s best chance came from a free kick when Tunisian Ahmed Aloulou, on his home debut, brought a full stretch save from Stirling keeper Calum Ferrie. Lewis Barr, pictured, grabbed the hosts' goal with a 25 yard strike. Dougie Brydon, on his debut after re-signing in midweek, then fired wide with a volley at the back post from a cross by Ross Brown after 35 minutes. But it was the visitors who took the lead after 43 minutes when they were awarded a penalty for a hand ball in the area and Mackin converted from the spot. Berwick struggled to get out of their own half in the second period and the visitors eventually went 2-0 up after 79 minutes when Smith glanced a header into the far corner. Late on Brennan, back in goal due to Kyle Allison’s suspension, saved Berwick again with a good reaction block from a shot by Jordan McGregor before Barr pulled a goal back for Berwick after 88 minutes with a cracking drive from 25 yards.